One hundred and fifty years ago Charles Darwin asked how a rain forest could contain so many species: “What explains the riot?” The same question still occupies the scientists who toil on Panama’s Barro Colorado Island. Tropical and steamy, these six square miles comprise the best-studied rain forest in the world, a locus of scientific activity since 1923. 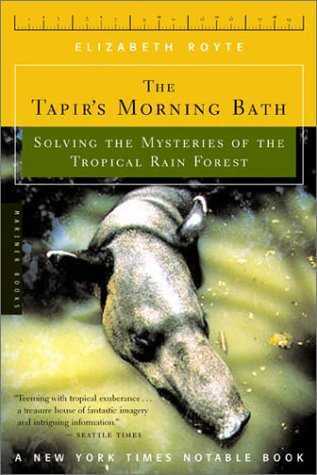 In The Tapir’s Morning Bath, Elizabeth Royte weaves together her own adventures on Barro Colorado with tales of researchers struggling to parse the intricate workings of the rain forest, the most complicated natural system on the planet. Through the lens of the field station, she also traces the history of modern biology from its earliest days of collection and classification through the decline of the naturalist to the days of intense niche specialization and rigorous scientific quantification. As Royte counts seeds and sorts insects, collects monkey dung and radiotracks bats, she begins to wonder: what is the point of such arcane studies? The world over, rain forests are rapidly disappearing and species are going extinct. While humanizing the scientists in the field, she explores the tension between their research and the reality of a world that may not have time for the answers.